Whitney is a Shareholder who practices in the Estate Planning and Probate Section. She is licensed to practice law in Texas. Whitney is passionate about serving her clients and connecting with them on a personal level. (8) guiding clients through the probate process after suffering the loss of a loved one. Whitney was raised in Fort Worth, Texas. She aspired to be a lawyer as a child and has been fascinated with the study of law and its impact on society throughout her life. 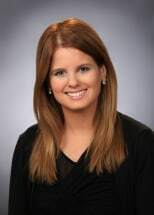 In August of 2012, Whitney settled in Midland and established her estate planning and probate practice. Later that same year, Whitney married her college sweetheart and native Midlander, Glen "Guy" J. Ellis, III. In their spare time, Whitney and Guy enjoy spending time with family and friends and locally volunteering with Buckner Family Place and Buckner Foster Care. Whitney is proud to call Midland her "home" and appreciates the opportunity to serve her community through the practice of law.